In the wake of the massive influx of refugees from Syria to Lebanon (2011-2014), some international NGOs have intervened in specific regions of Lebanon to prevent Lebanese and Syrian youth from “radicalizing” themselves and joining armed groups. In the presence of security and political risks, these NGOs play a sizable role in territories that often become destinations for refugees and migrants. We recognize their work as an effort to “neutralize” social spaces by stifling any factor causing local instability. In this framework, youth quickly come to be addressed as objects of concern but rarely as subjects of decision-making and aware action. Our study seeks to unpack international NGOs’ discourses about children’s vulnerability and protection, which are generally formulated according to universalized conceptions of childhood. This research is aimed at understanding the space between global security agendas, child protection, and humanitarian action. Finally, our study shows the controversial character of humanitarian agencies that alternate between depoliticizing younger generations and complying with the social order established by local power holders. Syria’s conflict is impacting neighboring countries in myriad ways. Since the conflict started in 2011 as a result of several anti-government street protests and the consequent heavy shelling of the opposition areas, more than one million Syrians fleeing violence and political persecution arrived in Lebanon. Among these Syrians are those who are registered with United Nations High Commission for Refugees (UNHCR) and in search of social and legal protection. Refugee influxes are generally considered to pose diverse challenges, ranging from the political to the socio-economic. Here, we choose to focus on the humanitarian programs meant to prevent North Lebanon-based children from joining armed groups currently combating in Syria. An example of these is Disarmament–Demobilization–Reintegration programs (DDRs) directed by international NGOs at 15-18 year-old youth. These programs target childhood in a bid to avert suitable conditions for armament. Through ethnographic research, semi-structured interviews with two large international NGOs, and in-depth interviews with local residents (both Syrians and Lebanese) in North Lebanon, our study primarily focuses on the Akkar region and the city of Tripoli. The research we are presently conducting unpacks international NGOs’ discourses about children’s vulnerability and protection, discourses formulated according to universalized conceptions of childhood. It also demonstrates the controversial character of humanitarian agencies that alternate between depoliticizing young generations and complying with the social order established by local power holders. Informal refugee camp next to the Syrian border. 'Akkar (North Lebanon), 2013. Photo taken by Estella Carpi. A number of international NGOs attempt to dissuade children who resettled in Lebanon from joining combating factions - especially the several armed Syrian opposition brigades—while prompting their families to send them to school and lead a “decent life.” Some of these NGOs provide vocational training to 14 and 15 year-old teenagers who dropped out of school in an attempt to discourage them from joining armed factions. “If the youth have education and professional skills, they won’t fear for their income and they won’t feel hopeless. That’s how they end up warring or even becoming suicide bombers,” an NGO worker affirmed during an interview. Similarly, another international NGO offers common school programs to Syrians and Lebanese children and youth, as the education and overall future of both communities are jeopardized. Indeed, young men from both nationalities are in fact recruited in takfiri (Salafi ideology) armed groups combating in Syria. As “beneficiaries,” both Syrian and Lebanese children do not need to be “infantilized,” that is to say, emptied of their political afflatus. In any situation of conflict and violence, they are always defensible since they are presumed to never have individual viewpoints. While here we are not promoting practices which would simply place blame on children and youth, we rather seek to highlight that the youth are the easiest vessels of humanitarian sympathy and generosity (Rieff 2002: 26), and this belief often leads to the humanitarian misconceptions of childhood that we will illustrate below. Although the Syrian government criminalized the recruitment of children by armed forces and non-institutional groups in 2013, such legal protection measures continue to be disregarded by all warring sides. As mentioned above, employment is considered the most effective dissuasive factor to avoid war recruitment. As a 2015 livelihoods assessment indicates (Save the Children and UNICEF 2015), families are struggling to meet their basic needs and feel they have no other alternative than putting their children to work, marrying off their daughters, and allowing their children to join armed groups. Moreover, official work permits are unlikely to be obtained nowadays for the Syrians who have relocated to neighboring nations. Without work permits, those working illegally risk imprisonment, fines, return to refugee camps, or even deportation to Syria. In addition, some children live in areas without functioning schools, as they have mostly been bombed by the Asad military aviation. Joining an armed group remains one of their few available options (HRW 2014: 2). Nevertheless, it seems to be quite difficult to gather reliable and detailed information about recruitment efforts inside Syria and in the neighboring countries. Indeed, war recruitment is a strategy that is inherent neither to Jihadist groups nor to Lebanon. For instance, in the Kurdistan region of Iraq, a child labor assessment found that 30% of children interviewed had been approached for recruitment (UNICEF 2014). Therefore, in the whole region affected by the Syrian crisis, joining presents benefits to children. 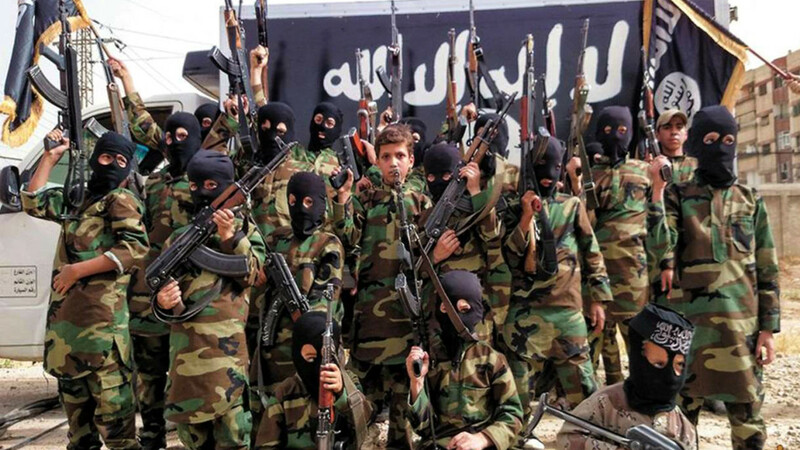 Children who join armed groups can in fact receive monthly salaries of up to US$400. Others participate without pay in order to join family members or friends, or because they have suffered on a personal level at the hands of one of the warring parties and desire to exact revenge. There is also very limited information about the willingness of children and young boys to join and serve armed groups in Syria today. However, generally, it has been noted that many children and adolescents are abducted and conscripted at an early stage. They latter turn into loyal fighters (Depuy and Peters 2010: 67). Likewise, young people recruited by government forces, or informal groups of government-affiliated thugs–Asad’s shabbiha in Syria—are often told that they are protecting their families and homes against “terrorists” who oppose the government. In this sense, indoctrination in governmental armed groups becomes a continuation and expansion of state propaganda. Reflecting media biases, international NGOs likewise maintain a number of misconceptions about the children they aim to serve. In fact, Syrian refugee children are homogeneously represented as vulnerable. They are quickly classified as innocent victims and impartial, with little opinion about the current conflict. More specifically, according to the analysis we have conducted so far, the misconceptions of the international NGOs are threefold. The first misconception resides in the definition of childhood and child vulnerability, influencing how need and aid are imagined. Indeed, the translation of “vulnerability” variously refers to local conceptions and ways of being addressed in Lebanon. “Vulnerable people” in Lebanon are often referred to with the expression “mustad’afun,” which literally means “the weakened.” This particularly stresses the political agentivity behind the low status and miserable condition of the individual. In other words, individuals are not weak per se, but they have been weakened by historical processes, usually started by political foes. The second misconception of the international NGO apparatus lies in the standardization of age-focused individual rights and social categories as a result of a universalization of western cultural standards. Indeed, childhood is not approached as a relative process that varies according to culture and context, but rather as a fixed age range. Thirdly, the NGOs addressing children tend to view regional sectarianism and violence as innate characteristics of Lebanon and Syria and as the very cause of conflict, thereby ignoring the territorial political issues and their connections to the whole region. Nevertheless, the lack of a constructive sense of citizenship and engaged civic participation are certainly not to be blamed on the international NGOs’ action per se, but rather on the longstanding state abandonment and state hostility in the northern Lebanese region, in addition to the widespread use of violence as an instrument to pursue political goals and elitist privileges. NGO language and implementation strategies thus largely influence and reify the category of “children in need,” who, in the Lebanese context, are merely associated with war and displacement. In brief, youth quickly come to be addressed in terms of objects of concern and rarely subjects of decision-making and aware action. Syrian primary school for refugee children, Tripoli (North Lebanon). Photo taken by Estella Carpi, 2013. As our current analysis indicates, the international NGOs that operate in North Lebanon believe they can act in a social void, one in which armament and recruitment are regarded and addressed as motivated simply by the ongoing conflict in Syria and hardly ever correlated to longstanding social rifts and unresolved political issues–sometimes not associable with community frictions–which concern the local residents to greater extent. From a local perspective, the children who join the activities promoted by these NGOs are not viewed in the same way as those exposed to higher risk of being recruited or voluntarily recruiting. According to the in-depth interviews that we conducted thus far with Tripoli’s residents connected to armed groups in Syria, the families whose children join the international NGOs’ activities are generally affluent or plugged in international networks. This local perception is noteworthy, as it illustrates how non-beneficiaries view addressed vulnerability as an empowered condition, as the privileged social status of some social groups. The parents collaborating with these NGOs are therefore believed as unwilling to send their children to fight, not being themselves prone to political violence. On the other hand, the local interviewees who were neither addressed nor approached by international NGOs highlighted how their children were not “manipulated” to undertake violence for the parental cause, but rather they reasserted that childhood is integral part of the parental effort to implement local and regional social justice. The recruitment of young boys in armed groups, across Lebanon as elsewhere, is a product of much complex social factors which are not simply associable with “evil adult recruiters” or structural features. While international law wants to see adults as conveyers of an inherently and unchangeably “violent culture,” it aprioristically tackles children as unaware perpetrators and objects of manipulation (Rosen 2010: 50), therefore detachable from the local predominant culture and society in which they grow up. To the same extent, these international NGOs tend to believe that the institutional and cultural environments they are able to provide structurally enable children to start a better life, or at least protect them against armed violence on a sustainable basis. While international humanitarianism is unlikely to see any act of the child as an expression of local culture and therefore “blameless,” the violence of adults is deemed as inherent to the cultural pattern at hand. This marks the epistemological contradiction which underlies the NGO efforts to foster an unconditioned primary depoliticization of children in North Lebanon. At the antipodes of a conception of childhood as politically engaged and aware beyond their exposition to war recruitment, international human rights protectors are overlooking a much more needed protection for children exposed to state and non-state terrorist attacks in schools and public spaces. This clearly points to a close correlation between child recruitment prevention and the generalized concerns of international security apparatuses. Our study will provide insights on how such global politics concerns are addressable through the ongoing NGOization of Lebanon. Depuy, K. E., Peters, K. (2010) War and Children. A Reference Handbook, Santa Barbara, CA: Praeger Security International, in the Contemporary Military, Strategic, and Security Issues. Rieff, D. (2002) A Bed for the Night: Humanitarianism in Crisis. With an Afterword on Iraq, New York City, NY: Simon & Schuster Publishers. Rosen, D. M. (2010) “Social Change and the Legal Construction of Child Soldier Recruitment in the Special Court for Sierra Leone”, in Childhood in Africa, an Interdisciplinary Journal, Issue 1, Vol. 2, p. 48-57. Save the Children and UNICEF (July 2, 2015) Small Hands, Heavy Burden. How the Syria Conflict is Driving More Children into the Workforce. Retrieved from: http://reliefweb.int/sites/reliefweb.int/files/resources/RS102356_CHILD%20LABOUR%20%285%29_low.pdf. UNICEF (2014) Assessment of the Situation of Child Labor among Syrian Refugee Children in the Kurdistan Region of Iraq. Estella Carpi is presently a Research Fellow at Lebanon Support (Beirut) and a Research Consultant for the New York University (Abu Dhabi). She received her PhD in Social Anthropology from the University of Sydney (Australia), with a research project on the social response to humanitarian assistance in Beirut’s southern suburbs and in the Akkar villages (Lebanon). In the past she also worked as a researcher at Trends Research & Advisory - Abu Dhabi, the United Nations Development Program (UNDP) – Cairo, and the International Development Research Center (IDRC) – Cairo, mostly focusing on social development, welfare, NGOs, and humanitarian emergencies in the Middle East. She has lectured extensively in the Social Sciences in Italy, Lebanon, and Australia. After studying Arabic in Milan and Damascus (2002-2007), she wrote her MPhil dissertation in Linguistic Anthropology on the everyday speech in contemporary Lebanon (2008). To access all her publications: https://nyuad.academia.edu/ESTELLACARPI. Chiara Diana is a Research Associate for the French Center for Economic, Juridical, Social Studies and Documentation (CEDEJ, Egypt). In 2015, she received her PhD in History from the Institute for Research and Studies on Arab and Muslim World (IREMAM) and the Aix-Marseille University (France). Her thesis research is a socio-history of social and political construction of childhood in Egypt during the Mubarak era (1981-2011). In the past, she taught at the Aix-Marseille University and the University of Sorbonne Nouvelle (Paris). Her current research interests include childhood and youth in Arab countries, activism and political socialization of young generations in revolutionary, post-revolutionary and conflict contexts. Her latest work is entitled “Children’s Citizenship: Revolution and the Seeds of an Alternative Future in Egypt” in Herrera Linda (ed.) and Sakr Rehab, Wired Citizenship: Youth Learning and Activism in the Middle East. New York: Routledge (2014). To access her publications: https://univ-amu.academia.edu/ChiaraDiana. The NGOs included in the present study will remain anonymous in order to protect the identity of their beneficiaries and their specific territories of intervention.